The Meitou family’s koji-making workshop (kura) is a long shed just off the main road in Osafune village. It is a small village located roughly midway between the old castle town of Okayama and the city of Ako, which was one of Japan’s earliest sea salt-making centers along the coast of the Seto Inland Sea and still is a major producer of high-quality sea salt used by the country’s food makers. Osafune itself is little more than a strip of homes and small businesses set amidst the broad fertile farmlands that characterize the landscape of Okayama prefecture. These farmlands are known for producing some of Japan’s richest, earthiest-tasting grains like Omachi rice—one of the few pure rice strains left in the country, whose bold flavor has made it the second-most widely-used rice for making sake by artisanal brewers. The Meitou family, however, uses Okayama’s famous rice, as well as barley, to make koji—the cultured grains that power Japan’s cuisine. Koji is a delicious mold grown on grains, which are then used to ferment, transform, and enrich other foods. The most common grains used to make koji are ones that are full of starch, like white rice, brown rice, and barley, with each type of grain contributing its own unique taste to the koji and to the foods and dishes that the koji, in turn, helps to create. Koji is the most important ingredient in miso, soy sauce, rice vinegar, mirin, and sake (which is used in cooking as much as for drinking). It is also used to make a seemingly endless array of other secondary fermented pastes, sauces, condiments, and drinks, with some of the most well-known being various types of salty shio-koji and sweet amazake preparations. Koji is also used directly as a seasoning for both savory and sweet cooking. Koji enables quick cooking techniques by tenderizing foods and boosting their flavor, it preserves seasonal foods for future enjoyment through secondary fermentation, and it suffuses dishes with depth, complexity, and umami richness. For all these reasons, it plays an essential role in Japan’s light, yet deeply satisfying, ingredient-oriented cuisine. Meitou’s current koji masters are the third-generation brothers Ryuhei and Yohei, who are helped by their father Noritaka and an assistant, Fumiaki Matsuo. The Meitous are leaders among a small and disappearing group of artisanal koji makers in Japan, whose art is making a range of types of koji by hand using all-natural, locally-grown ingredients. The brothers’ grandfather Kikuro started the business in 1954 to supply home cooks with the koji they needed to make their own miso. Miso is easy to make. You boil a batch of soy beans, mash them, mix in koji and salt, pack the mash into any kind of airtight container, and then let the concoction sit in a cool dark place for a few months for a sweet, mild miso and for a year or more for a rich, deep-tasting one. Making koji, on the other hand, is tricky. At Meitou, Ryuhei and Yohei carefully polish the rice and barley to leave enough of its outer layers intact to maximize the flavor of the grain while also ensuring that the right amount of the grain is exposed to provide a fertile breeding ground for the koji. Next, they precisely steam the grains so that they are not overly saturated with water and, also, do not clump together. The steamed grains are then inoculated with koji mold spores (Aspergillus oryzae), spread on pans, and put into a muro room. This is where the real art of koji-making takes place. Over the next 48 hours, Ryuhei and Yohei must maintain consistent sauna-like conditions in the muro—a constant 38 degree Celsisus temperature and 90% humidity—so that the koji mold spores take hold and germinate. Anything below that temperature and the koji will not germinate. Anything above will cause the koji to die off. 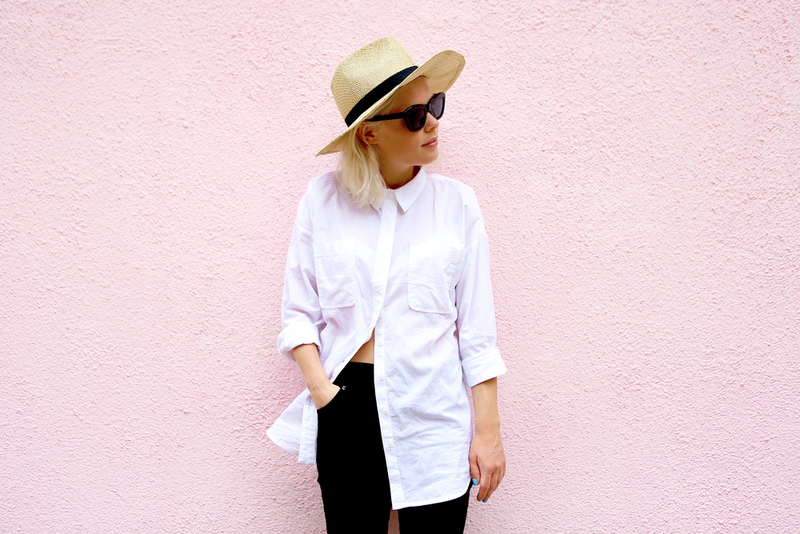 It is not just a matter of setting a thermostat. As the koji germinates, it generates its own heat, starting at the bottom of the pans. To maintain the koji’s optimum temperature, and also aerate and breathe life into the koji, Ryuhei and Yohei turn and mix the grains by hand every six hours, largely knowing by feel that the right conditions have been met. At the same time, they massage the grains so that each one comes in contact with the koji mold and a robust koji is created. After two days, the process is complete. The koji has a chewy, fruity, rich, candy-like taste and aroma. 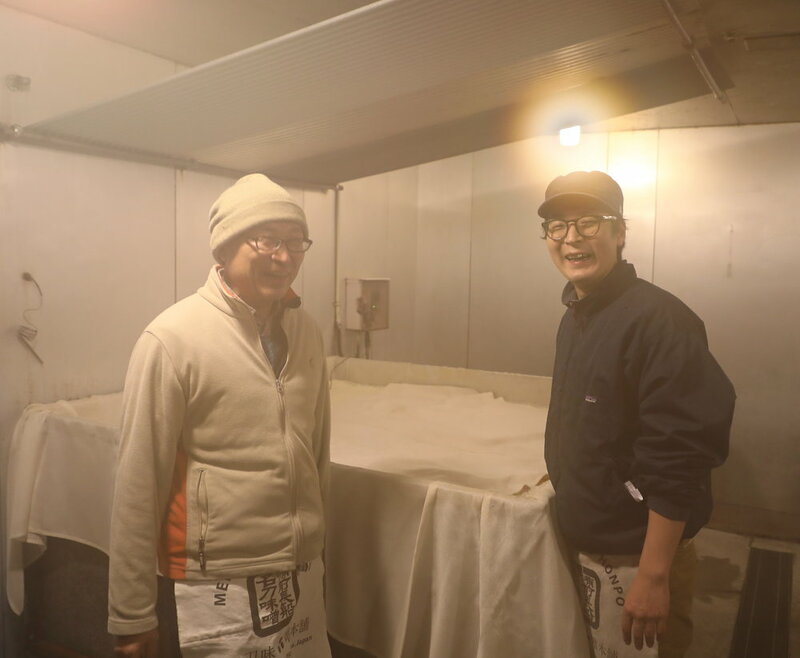 From right to left: Yohei Meitou with his father Noritaka Meitou in their sauna-like muro room during the first day of culturing a batch of white rice into koji. At this stage in the process, each grain of rice has sprouted white koji mold; in one more day they will be covered in a white fuzz and ready to be used. From right to left: one kilogram bags of fresh brown rice koji and white rice koji. Until the 1950s, miso was commonly made at home in Japan, with each household having its own recipe, providing a unique flavor to its cooking. Above all, a household was judged by the quality and flavor of its miso soup. Most home cooks got the koji they needed to make miso from a professional koji maker. One either bought koji from them or brought their home-grown grains to the koji maker and had them culture it into koji. (A koji maker’s role is similar to that of a French village baker, who makes bread for sale to the community or bakes the dough that local residents bring to them. A better French analogy for the essential culinary services a koji maker provides to home cooks would be that of a French village maker of stock—someone who solely made stocks for the community or turned the bones, scraps of meat, vegetable ends, and seasonings brought to them into the stocks used by home cooks as the foundation for all of their soups and sauces.) Japanese home cooks could also get their koji from their neighborhood soy sauce maker, who would culture the grains brought to them alongside the koji they made for their own use. But by the early 1950s, many of Japan’s professional koji makers were going out of business. The rise of commercially-made, store-bought miso fueled by a rapidly urbanizing population and faster-paced lifestyles meant fewer people made miso at home. Artisanal soy sauce brewers were also disappearing, being replaced by large commercial brewers that made soy sauce in distant locations and often by quick and chemically-induced processes using artificial ingredients. Amidst this decline, Kikuro started his business to help his neighbors maintain their traditional cooking practices. He was also in need of work that matched his skills. He had been employed at a local soy sauce brewery, where he learned the art of koji making, but it was threatened by the changes in the industry. More important, and poignant, Kikuro had lost his eyesight due to an illness, and making koji, by relying on his senses of touch and smell, was something he could do. To facilitate his work, Kikuro designed unusually large square pans in which to make koji. Their large size created fields of koji and clouds of aroma to help guide his hands and nose. Kikuro became a master koji maker because of the highly sensitive way he worked; skills that enabled him to develop important innovations in koji making. In the 1960s, he created brown rice (genmai) koji. Because the koji mold spores need to enter the grain of the rice to thrive, well-polished white rice (hakumai) and barley (o-mugi) were the traditional types of grains used to make koji. White rice koji is mild and sweet and barley koji has a nutty flavor. To make brown rice koji, Kikuro devised a way to cut into the whole rice just enough to create openings for the spores to enter the grain while leaving nearly all of the flavorful outer bran and germ intact. Meito’s brown rice koji is an earthy, flavorful, wholesome koji packed with vitamins, minerals, and fiber. Meitou’s dried barley koji can be used for up to six months, if kept in a cool, dark place. Kikuro also invented a way to extend the shelf-life of koji. Fresh koji (nama-koji) needs to be used within 10 days (or within 2 months if put in the freezer) after being made. Kikuro learned how to dry the koji so that its fermentation was made dormant, but not killed. The process involves blowing warmed air through the koji from the bottom of the pans toward the end of the fermentation process. It largely relies on the koji maker’s touch to know exactly when the koji is ready to be harvested. Meitou’s dried koji (kansoku), which is available as brown rice, white rice, and barley koji, will keep for 6 months if stored in a cool, dark place. Kikuro’s innovations helped spark a revival in making miso at home. Dried koji enables city dwellers to make miso because they can now buy koji at local outlets. Meitou’s brown rice koji, in turn, prompted a new interest in all-natural, homemade miso because of its healthy pro-biotic benefits. Before he passed away in 2016 at the age of 90, Kikuro trained his grandsons in his techniques, and they are continuing the tradition of making handmade koji using the best possible local ingredients. 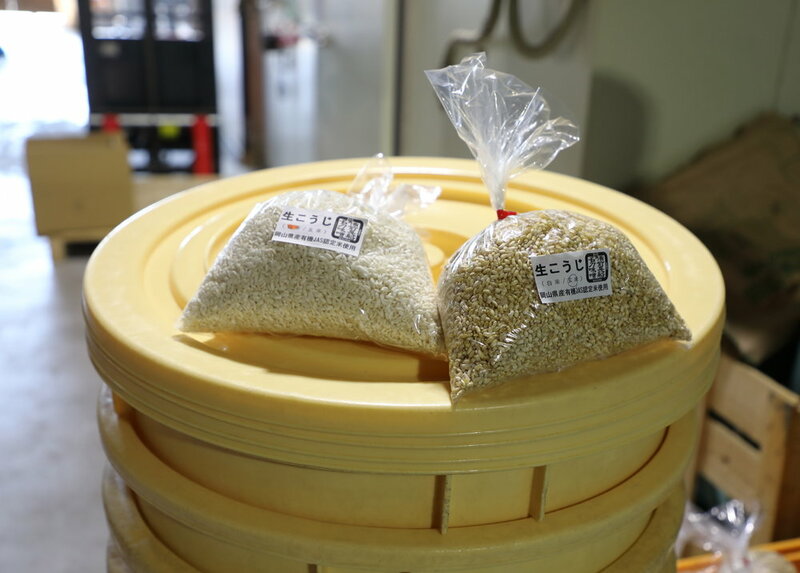 The grains Ryuhei and Yohei use to make koji include Asahi-mai, another one of Okayama’s rare, pure strains of rice, and the barley hybrid Sachiko Golden. The water used is hard water from a well on the property, which is laden with wild microbes and minerals that aid fermentation and also contribute to the unique taste of place of their products. The brothers make both fresh and dried koji year-round in small batches of 20 kilograms each of white rice, brown rice, and barley koji, working in 48-hour rotations that start on Monday to Tuesday and continue Tuesday to Wednesday, and Wednesday to Thursday. All of the koji is ready for sale on Friday. The fresh koji is always sold out, and the way to obtain some is to order it at least two weeks in advance. The dried koji is more readily available. Ryuhei and Yohei also continue to work in a variety of ways to support cooks’ efforts to make miso at home. This includes supplying them with locally-grown soy beans and sea salt for a complete do-it-yourself, miso-making kit. They will also culture grains brought to them by customers who want to do their own farm-to-table cooking and create a “terroir” taste for their miso. Ryuhei Meitou packing bags of dry soy beans to provide customers with all of the ingredients they need to make miso at home. In the 1980s, Ohsawa Japan, the country’s pioneering provider of high-quality health foods, asked Kikuro, as Japan’s only maker of brown rice koji at the time, to make brown rice Genmai Miso for them to distribute. Today Meitou makes three types of miso using full fat, locally-grown whole marudaizu soy beans. (These soy beans are the Sachiyutaka hybrid that was especially developed for the climate and growing conditions of western Japan.) Each of the misos is deliciously unique. The brown rice Genmai Miso has a deep, rich, full flavor and meaty texture. Its salt content is 10%. Their white rice Ama Miso has a base of white rice koji, with the rice being polished to a greater degree than the rice used to make the other types of rice koji, so that the final miso is very creamy. The Meitous age the Ama Miso for only one month and give it a salt content of 7%. It has a beautiful color, wonderfully smooth texture, and a balanced flavor, being not as sweet as most other white misos available in Japan. The third miso is called Awase-Koji Miso and is made with a mixture of brown rice and barley koji and is both uniquely delicious and nutritious. In Japan, koji is considered a chomiryo, or seasoning. It is fermentation as an essence, with all of the umami-richness, savory goodness, and pro-biotic benefits that implies. It has a range of attributes that make cooking easier and foods more delicious, nutritious, and interesting. In addition to adding umami richness to all kinds of food, including savory and sweet, it can marinade and tenderize meats, support light cooking techniques and shorten cooking times, be used as the foundation for a nearly limitless range of secondary pastes (like miso), sauces, dressings, and condiments, and, lastly, add its own distinct flavoring depending on the grain with which it is made. White rice koji is the mildest koji and tends to add citrusy and floral notes and sweetness. Brown rice koji has a stronger, earthy flavor and is also higher in fiber, vitamins, and minerals. Barley koji has a nutty flavor. Because it is plant-based, koji is an excellent substitute for dashi in vegetarian and vegan kitchens. It is also an excellent substitute for other meat-based sources of umami richness, like butter, cream, and cheese. And because it coaxes out the inherent flavors of foods, less salt is needed to make foods taste more like themselves. Two other commonly-used forms of koji seasoning are shio-koji and amazake, both of which can be used in savory and sweet cooking. The Meitous make two types of salty shio-koji and three types of sweet amazake. Shio-koji is a second ferment made from koji, cooked rice, salt, and water. Meitou’s shio-koji is a smooth puree, enabling its use as a marinade and enhancing its use as a seasoning. The other type of shio-koji Meitou makes is called hishio, or soy sauce koji. It combines koji and soy sauce. Both should be thought of as fermented forms of umami-enriched salt, with the hishio being particularly umami-rich because it contains ten times more glutamine than the shio-koji. The hishio is so satisfying that it can be eaten as a snack. It is even better when mixed with finely-diced vegetables like cucumber, carrots, onions, and eggplant. Amazake is a chunky, wet type of sweet koji. It is made by heating koji, sticky mochi rice, and water together and allowing the mixture to ferment. Amazake is traditionally mixed with fresh fruit juice or more water and served warmed as a health drink. Amazake, however, can also be used as a fermented sweetener for savory dishes instead of other forms of sugar to add depth, complexity, and pro-biotics to a dish. Because of its paste-like consistency, it is especially good in braised dishes, added at the end of cooking. Amazake is more often added to sweet confections. Meito makes three types of amazake: white rice, brown rice, and a unique black rice amazake. Hard to make, the black rice amazake (kuromai) is very nutritious because black rice is high in vitamins, minerals, and fibers and also has one of the highest levels of anthocyanin (a type of antioxidant) found in foods. Meitou’s black rice amazake is also intensely, naturally sweet, and can be eaten as a dessert as is. Its many possible applications in sweet and savory cooking include those that would especially benefit from its striking deep purple color (the anthocyanins in the rice turn from black to purple when cooked) and high sugar content of 48%. Meitou’s white rice amazake tastes like a sweet rice porridge and its brown rice amazake has a deliciously chewy, sweet, oatmeal-like taste and texture. They both have a sugar content of 43%. The shop at Meitou Miso is open every day except for Sundays and holidays from 9:00 to 17:00. All of the family’s products can be bought there or ordered online through their website and delivered anywhere in Japan. The Meitou family is happy to give visitors a tour of their workshop if you call in advance and let them know you are coming. They only speak Japanese. It’s easy to get to Meitou Miso by train. After arriving in Okayama City at Okayama Station on the shinkansen bullet train, change to the local Ako Line for a 29-minute ride to Osafune. From Osafune train station it’s less than a 10-minute walk to Meitou’s workshop. A refrigerator case of Meitou’s fresh miso, koji, amazake, and other products at the entrance to the workshop. One of the best places to buy Meitou’s products is at the Tottori-Okayama Shimbashi-kan in Tokyo. Located near Shimbashi station, this is one of the largest prefectural “antenna” shops in the city, offering a wide range of food products and crafts from both Okayama and neighboring Tottori prefectures. Meitou’s brown rice Genmai Miso. Meitou’s white rice Ama Miso. Although it is largely a rural prefecture, Okayama has a number of must-see sights for any visitor to Japan’s countryside. These include Okayama Castle and its magnificent garden Kōrakuen, the historic salt-trading town of Kurashiki, the pottery kilns of Inbe that produce rustic, unglazed Bizen Ware, one of Japan’s most-prized types of pottery, and the offshore islands that comprise the Benesse Art Site Naoshima. All of these attractions are within easy reach of Okayama City, which is the prefecture’s capital and a stop on all of the shinkansen bullet trains that travel through western Japan. The train ride from Osaka to Okayama is 49 minutes. From Hiroshima in the opposite direction, Okayama is an even shorter 40-minute journey. A package of “Hishio no Hana” koji for making hishio at home alongside a Bizen ware pot in which to ferment hishio. The pot is specially designed and made for Meitou’s customers by Ichiyou Kimura, a 13th generation potter working in the Bizen tradition at a kiln in the village of Inbe. Located in the center of Okayama City, Kōrakuen is one of the “Three Great Gardens” of Japan, along with Kenroku-en in Kanazawa and Kairaku-en in Mito, north of Tokyo. Kōrakuen was built in 1700 by the feudal daimyo lord of Okayama Ikeda Tsunamasa in the large landscape “stroll” garden style popular at the time. The garden is beautifully situated along the Asahi River opposite Okayama Castle, and is extraordinary in the way it abstracts nature to a degree that its features appear to be large modernistic sculptures and landscape designs. It is also unique in the way it incorporates fields of rice and green tea in the garden. Winter view of the Iris Gardena at Kōrakuen. The ferry terminal at Uno Port outside Okayama City is the main gateway to the Benesse art project on Naoshima Island and its neighboring islands of Teshima and Inujima. In its way, the Benesse art project is a modern-day “stroll” garden that incorporates a collection of features that include modern art museums, art installations, quaint fishing villages, and craft workshops in a spectacular landscape of sea and islands. 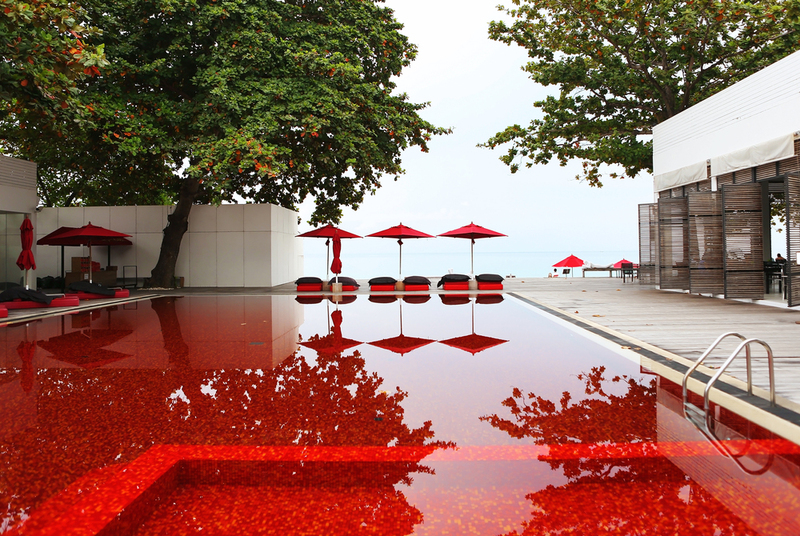 There are a number of places to stay on the islands, including the unique and luxurious Benesse House, which is a complex of buildings that function as both places to stay and contemporary art museums. 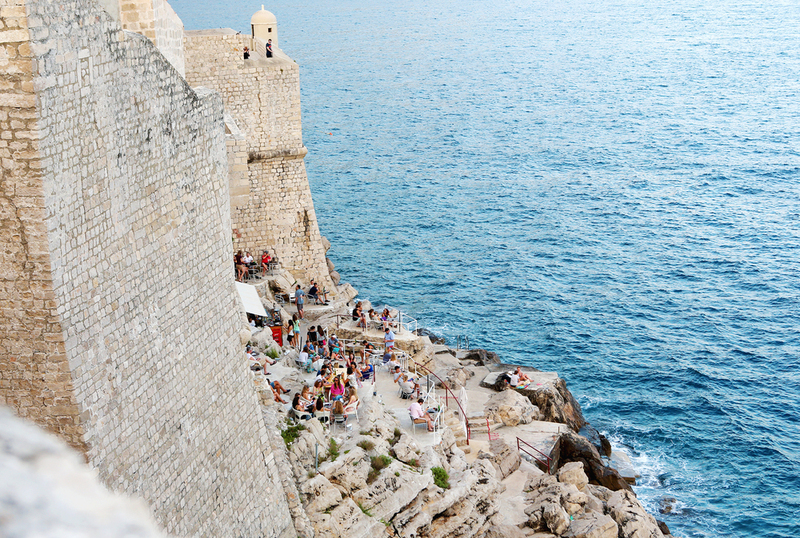 There is also a range of inns, guest houses, and bed-and-breakfast accommodations, and at least a two-day visit to the islands is recommended. From Naoshima, there are ferries to Shodoshima Island, one of Japan’s major soy sauce producing centers. 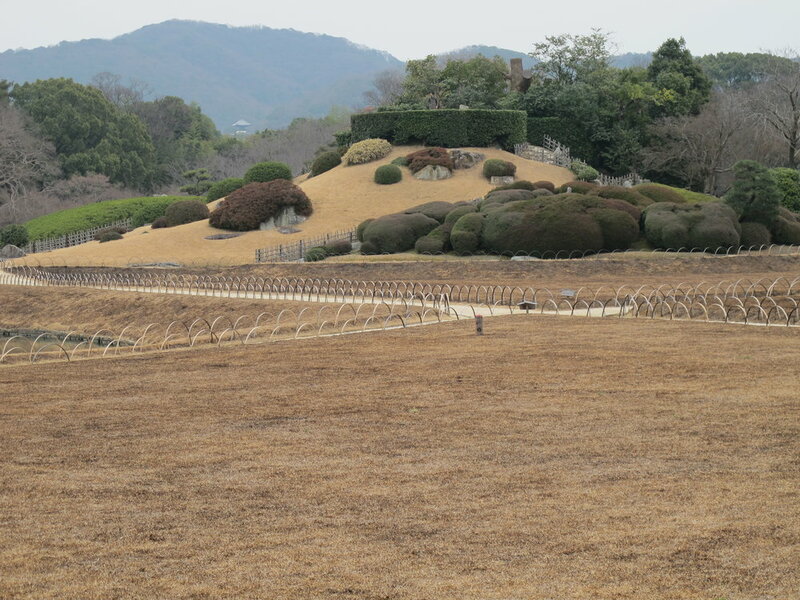 Outer garden and walkway to the Lee Ufan Museum on Naoshima Island. The Go’o Shrine on Naoshima Island was designed by the photographer Hiroshi Sugimoto. A hallway in the Beach building of the Benesse House hotel designed by Tadao Ando.